It’s no wonder farming groups are disappointed by the government’s decision not to extend the powers of the Groceries Code Adjudicator, Christine Tacon, to cover primary producers. Suppliers were “finally opening up” but could still be “more forthcoming” in coming forward with their issues with retailers, Christine Tacon claimed. The supermarket watchdog is making significant progress tackling unfair trading in the grocery supply chain, but more must be done to tackle the “climate of fear” that stops suppliers speaking out. The Groceries Code Adjudicator’s annual conference in Westminster carried additional significance this year as it marked the end of Christine Tacon’s first term and raised questions about the organisation’s long-term direction and future remit. 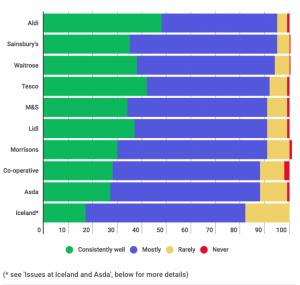 Asda and Iceland have come bottom of a league table ranking UK supermarkets on fair trading practices with suppliers, while Aldi and Sainsburys have come top. 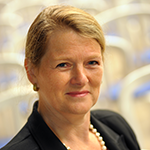 Consumer Minister Margot James has today (26 June 2017) announced the reappointment of Christine Tacon CBE as the Groceries Code Adjudicator (GCA). “This reappointment recognises the significant and valuable contribution of Christine Tacon in ensuring suppliers get a good deal when doing business with supermarkets. I have been co-opted as a Non Executive Director of Anglia Farmers, the £250m turnover buying group commencing Sept 2012. I have been accepted as a Public Member of Network Rail: there are 30 Public Members who act as shareholders, serving a 3 year term commencing Nov 2012.